Here am going to share a traditional dish from Kerala cuisine. Sweet and sour pickle / Inji puli / Puli inji is a dark brown Keralite curry made with fresh ginger, green chilies, jaggery, tamarind and other spices. A spicy, tangy condiment which is one of the main dishes served in Onam sadya. Without Inji puli Kerala feasts (sadhya) is incomplete. 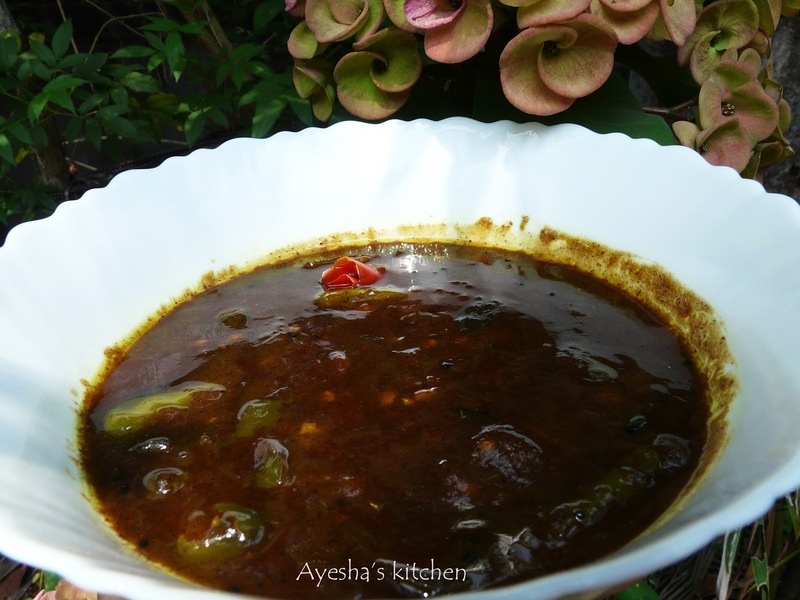 Here is the recipe showing how to make puliyinji / Inji puli / Puli inji / sweet and sour sauce with fresh ginger. Soak tamarind in one cup of warm water and set aside. Heat a pan with 2 tbsp of coconut oil and add finely chopped ginger, curry leaves and green chilies. Toss until it is nicely browned. Then add turmeric powder, red chili powder to it and saute until raw smell goes. Now press tightly the soaked tamarind with your hands and pour the water to the sauteed mixture. Mix well and let it boil. Mash the jaggey cubes well and then add it. Mix well and add salt. (if you don't prefer more sweetness, add less jaggery ). Let it cook on a medium flame until it thickens. Stir occasionally. When done, off the flame. Heat a pan with some oil and splutter mustard seeds, then toss dried red chili and curry leaves. Pour it over the prepared puli inji. It will thicken once it is cooled. Tasty Injimpuli is ready to serve.